Let’s talk USB drives, a Resource Guide! 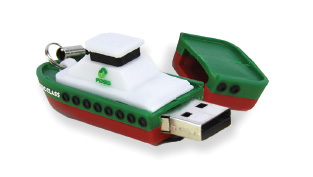 Things to consider when creating your custom USB flash drive. 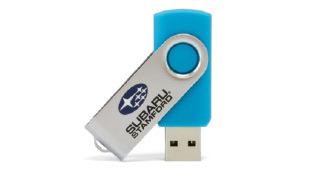 The USB flash drive you choose can have the storage capacity of 64 MB, up to 128 GB. The minimum and maximum size capacity does however depend on the type of flash drive you want to create. See the USB flash drive types section below for more information. If you are looking to share files and information on your flash drives you should consider the data upload option. 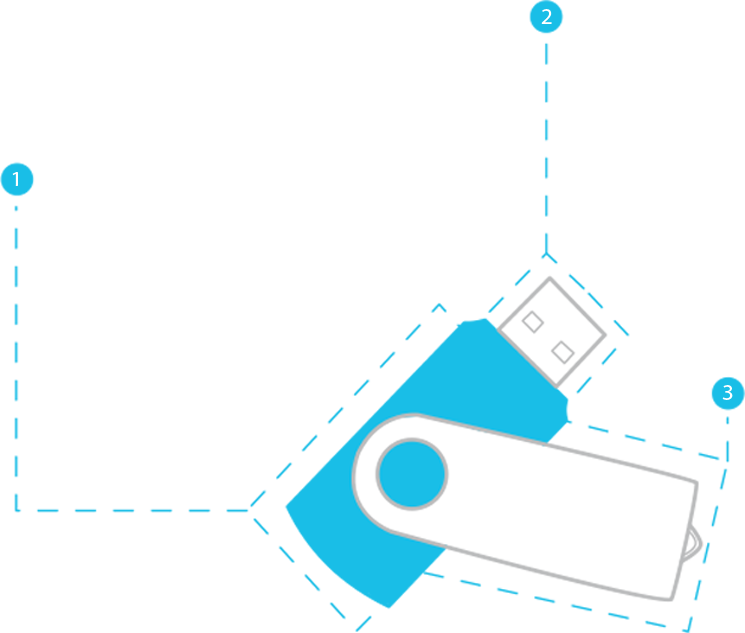 With data upload we can upload your files in bulk directly to the flash drives in production; this is a great option to save time. – Be aware of the size capacity of your drive. To the right is a table that details the maximum data upload depending on the capacity of the drives you choose. – Make sure the files you want to be uploaded are organized by how you want them to appear, this includes file names, formats and folder structure. Depending on the type of USB flash drive you are creating the imprint size, and imprint area will vary. Typical imprint areas are on the drive cap, and the body of the drive. 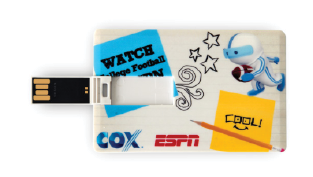 Your USB flash drive design can be imprinted by using silk screen printing or laser engraving. Produced from high-grade leather and refined metal, these custom USB flash drives are a great fit for that bold, rugged look with the added versatility of its materials. 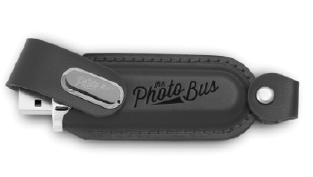 The leather USB flash drives are a perfect choice for construction, architecture, and outdoor industries. 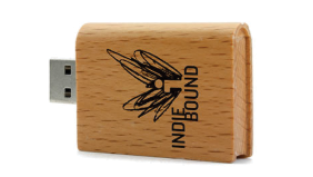 The wooden USB flash drives are available in Pine, Walnut, Mahogany, Bamboo, Maple Bamboo and Fiber Wood. You are able to choose between our 1 – 2 color imprinting, or burn-in engraving. Both imprint options will leave a permanent, unique to help brand your business or event. 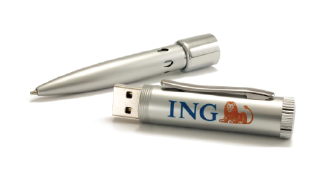 Custom USB flash drive pens are available in black, silver, blue, and more. The metal-aluminum flash dove is perfect for displaying your logo, contact information, or a personalized message on the top half of the pen. You are able to imprint on the front and back of the pen. The card USB flash drives provide top-notch, clear, edge-to-edge printing. These custom card flash drives have a slim profile making it easy for your customers to slide them into a wallet or put them in their purse just like any other business card. 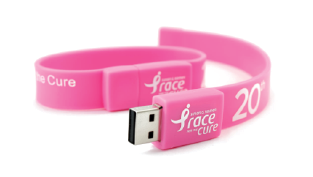 Get your personalized wristband USB flash drives in practically any color you can imagine. You can carry all your information hands-free, making this a great flash drive for students, schools, clubs, and music fans. Custom USB flash doves are great for catching attention and showcasing what your company is about. These flash drives can be made from nearly any material, metal, silicone, marble, plastic, leather, rubber and more. You can create your USB as a 2-D or 3-D shape. The most popular custom USB flash drive style is the swivel. The swivel claps is a great feature that conceals most USBs. These are good for any business that will use these for gifting or doing giveaways. With swivel drives you are able to imprint on either side of the swivel. Keep in mind what your flash drive will be used for and/or how much transferring of information will be performed with your dove. USB 2.0 and 3.0 possess a few differences you should be aware of. 2.0 USB’s are cheaper to produce. Maximum capacity for 2.0 flash drives is 64 GB. The USB 3.0 provides a much faster data transfer rate, making the maximum rate about 5 GB per second (about 10 times faster than the USB 2.0). These USB’s are a bit more expensive due to the more advanced technology that these devices use. Maximum capacity for 3.0 flash drives is 128 GB. 24-Hour Turnaround: Need custom USB’s tomorrow? We offer 24-hour production turnaround for select products. Quick Ship: Need a last minute order? Quick Ship is the best option for you. With Quick Ship you will have your products within 7 days after your proof has been approved. Find the best options for you. This option offers affordable products and fast shipping. Imports: Buying a large quantity? This is the perfect production option for you. With Imports you will save on your order, when purchasing a high volume. Sourcing: The Sourcing option allows 100% customization for your orders that fit your budget while still offering the best quality.